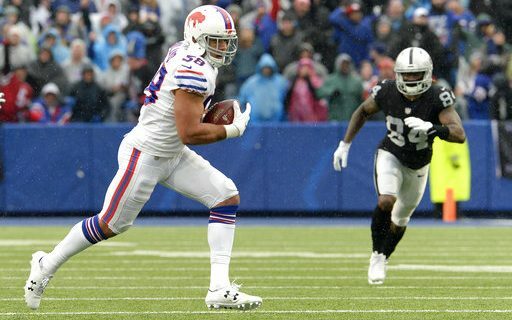 After watching the Bills dismantle the Oakland Raiders by a score of 34-14, I went back and thought about the preseason. During that four game period, this team did not look anywhere close to being a playoff contender. They were sloppy, not cohesive and had far too many penalties. Now seven games in to the 2017 NFL season, the Bills stand 5-2 for the first time since 2011. That record leaves them a half game behind the New England Patriots, a team the Bills must play twice the second half of the season. There was a lot to like about the Bills win. The first thing that comes to mind is the play of rookie linebacker Matt Milano. Milano was a fifth round draft pick for the Bills last April but he’s played as if he was drafted much higher. Milano has been playing because of an injury to starter Ramon Humber. The way Milano has played, he may be the starter even when Humber gets healthy! Last week Milano had an interception and yesterday he forces a fumble and recovers another that he returned for a touchdown near the end of the first half. That play broke the game open for the Bills. In watching Milano, he has been solid in both coverage and run support and well as making a presence on special teams. Wide receiver Andre Holmes is a former Raider, so you know he wanted to come up big against his former team. He did! Holmes finished the game with three catches for 51 yards and a touchdown. A couple of the catches were circus type receptions showing that he has outstanding hands and tracks the ball very well. Holmes may never be a starter, but he can be a very valuable third or fourth receiver especially because he does such a good job on special teams. Shady McCoy had perhaps his best game of the season, rushing for 151 yards on 27 carries and a touchdown (48 yard run to end the Bills scoring). He also added another 22 yards on six receptions. McCoy was his consistent self and shows why he may be the most valuable player on the offense. Offensive Coordinator Rick Dennison called a very good game. Because of the weather conditions, airing the ball out was not a real option. He did a great job mixing the run and the pass as the Bills controlled the ball for 35:37. Tyrod Taylor played another very good game. While he only passed for 165 yards, he completed 20 of 27 throws and did not throw an interception. The offense as a whole did an excellent job as the line blocked well and there were no turnovers. The key to winning in the NFL is to limit turnovers and the Bills have done a good job with that all season. The defense as a whole played another outstanding game. They forced four turnovers and while they gave up some yardage, they made Oakland earn every yard they got. The defense as a whole has become a turnover machine as they have forced three or more turnovers in each of the last four games. Safety Micah Hyde continues his Pro Bowl type season by getting his fifth interception and the season isn’t half over yet! As we have seen all year, the Bills coaching staff was outstanding. Through seven games we can make the case that the Buffalo Bills might be the best coached team in the AFC or even perhaps the whole NFL so far this season. I said it last week but it needs repeating, Sean McDermott is on pace to become the NFL’s Coach of the Year. What a great hire! This week is a short week as the Bills travel to New Jersey to face the New York Jets on Thursday night. The Bills can’t take the Jets lightly as they have won three games since the Bills beat them 21-12 on opening day. The Jets are a much improved football team and quarterback Josh McCown is playing as well as at any time during his career.